The Combined Cycle Power Plant or combined cycle gas turbine, a gas turbine generator generates electricity and waste heat is used to make steam to generate additional electricity via a steam turbine. The gas turbine is one of the most efficient one for the conversion of gas fuels to mechanical power or electricity. The use of distillate liquid fuels, usually diesel, is also common as alternate fuels. More recently, as simple cycle efficiencies have improved and as natural gas prices have fallen, gas turbines have been more widely adopted for base load power generation, especially in combined cycle mode, where waste heat is recovered in waste heat boilers, and the steam used to produce additional electricity. This system is known as a Combined Cycle. The basic principle of the Combined Cycle is simple: burning gas in a gas turbine (GT) produces not only power – which can be converted to electric power by a coupled generator – but also fairly hot exhaust gases. Routing these gases through a water-cooled heat exchanger produces steam, which can be turned into electric power with a coupled steam turbine and generator. This type of power plant is being installed in increasing numbers round the world where there is access to substantial quantities of natural gas. A Combined Cycle Power Plant produces high power outputs at high efficiencies (up to 55%) and with low emissions. In a Conventional power plant we are getting 33% electricity only and remaining 67% as waste. By using combined cycle power plant we are getting 68% electricity. It is also possible to use the steam from the boiler for heating purposes so such power plants can operate to deliver electricity alone or in combined heat and power (CHP) mode. 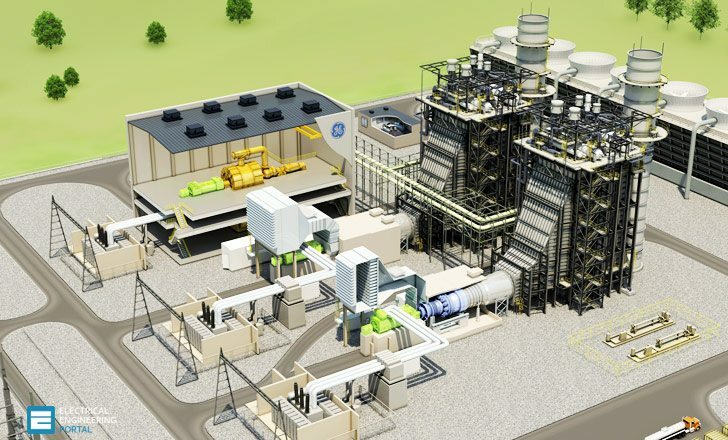 Combined cycle power plant as in name suggests, it combines existing gas and steam technologies into one unit, yielding significant improvements in thermal efficiency over conventional steam plant. In a CCGT plant the thermal efficiency is extended to approximately 50-60 per cent, by piping the exhaust gas from the gas turbine into a heat recovery steam generator. However the heat recovered in this process is sufficient to drive a steam turbine with an electrical output of approximately 50 per cent of the gas turbine generator. The gas turbine and steam turbine are coupled to a single generator. For startup, or ‘open cycle‘ operation of the gas turbine alone, the steam turbine can be disconnected using a hydraulic clutch. In terms of overall investment a single-shaft system is typically about 5 per cent lower in cost, with its operating simplicity typically leading to higher reliability. First step is the same as the simple cycle gas turbine plant. An open circuit gas turbine has a compressor, a combustor and a turbine. For this type of cycle the input temperature to turbine is very high. The output temperature of flue gases is also very high. This is therefore high enough to provide heat for a second cycle which uses steam as the working medium i.e. thermal power station. This air is drawn though the large air inlet section where it is cleaned cooled and controlled. Heavy-duty gas turbines are able to operate successfully in a wide variety of climates and environments due to inlet air filtration systems that are specifically designed to suit the plant location. Under normal conditions the inlet system has the capability to process the air by removing contaminants to levels below those that are harmful to the compressor and turbine. Chlorides, nitrates and sulfates can deposit on compressor blades And may result in stress corrosion attack and/or cause corrosion Pitting. Sodium and potassium are alkali metals that can combine with Sulfur to form a highly corrosive agent and that will attack portions of the hot gas path. The contaminants are removed by passing through various types of filters which are present on the way. Gas phase contaminants such as ammonia or sulfur cannot be removed by filtration. Special methods are involved for this purpose. The air which is purified then compressed and mixed with natural gas and ignited, which causes it to expand. The pressure created from the expansion spins the turbine blades, which are attached to a shaft and a generator, creating electricity. In second step the heat of the gas turbine’s exhaust is used to generate steam by passing it through a heat recovery steam generator (HRSG) with a live steam temperature between 420 and 580 °C. In Heat Recovery Steam Generator highly purified water flows in tubes and the hot gases passes a around that and thus producing steam .The steam then rotates the steam turbine and coupled generator to produce Electricity. The hot gases leave the HRSG at around 140 degrees centigrade and are discharged into the atmosphere. The steam condensing and water system is the same as in the steam power plant. The combined-cycle system includes single-shaft and multi-shaft configurations. The single-shaft system consists of one gas turbine, one steam turbine, one generator and one Heat Recovery Steam Generator (HRSG), with the gas turbine and steam turbine coupled to the single generator on a single shaft. Multi-shaft systems have one or more gas turbine-generators and HRSGs that supply steam through a common header to a separate single steam turbine-generator. In terms of overall investment a multi-shaft system is about 5% higher in costs. The primary disadvantage of multiple stage combined cycle power plant is that the number of steam turbines, condensers and condensate systems-and perhaps the cooling towers and circulating water systems increases to match the number of gas turbines. Roughly the steam turbine cycle produces one third of the power and gas turbine cycle produces two thirds of the power output of the CCPP. By combining both gas and steam cycles, high input temperatures and low output temperatures can be achieved. The efficiency of the cycles adds, because they are powered by the same fuel source. To increase the power system efficiency, it is necessary to optimize the HRSG, which serves as the critical link between the gas turbine cycle and the steam turbine cycle with the objective of increasing the steam turbine output. HRSG performance has a large impact on the overall performance of the combined cycle power plant. The electric efficiency of a combined cycle power station may be as high as 58 percent when operating new and at continuous output which are ideal conditions. As with single cycle thermal units, combined cycle units may also deliver low temperature heat energy for industrial processes, district heating and other uses. This is called cogeneration and such power plants are often referred to as a Combined Heat and Power (CHP) plant. The efficiency of CCPT is increased by Supplementary Firing and Blade Cooling. 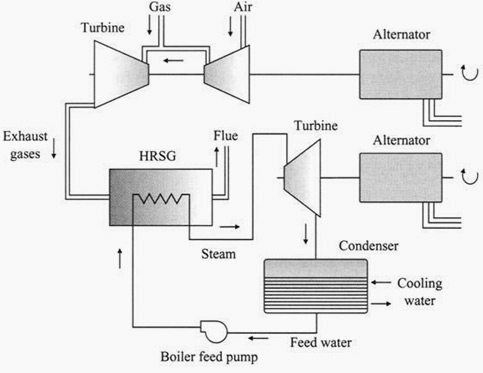 Supplementary firing is arranged at HRSG and in gas turbine a part of the compressed air flow bypasses and is used to cool the turbine blades. It is necessary to use part of the exhaust energy through gas to gas recuperation. Recuperation can further increase the plant efficiency, especially when gas turbine is operated under partial load. The turbines used in Combined Cycle Plants are commonly fuelled with natural gas and it is more versatile than coal or oil and can be used in 90% of energy applications. Combined cycle plants are usually powered by natural gas, although fuel oil, synthesis gas or other fuels can be used. To control the emissions in the exhaust gas so that it remains within permitted levels as it enters the atmosphere, the exhaust gas passes though two catalysts located in the HRSG. One catalyst controls Carbon Monoxide (CO) emissions and the other catalyst controls Oxides of Nitrogen, (NOx) emissions. Aqueous Ammonia – In addition to the SCR, Aqueous Ammonia (a mixture of 22% ammonia and 78% water) is injected into system to even further reduce levels of NOx. In conventional power plants turbines have a fuel conversion efficiency of 33% which means two thirds of the fuel burned to drive the turbine off. The turbines in combined cycle power plant have a fuel conversion efficiency of 50% or more, which means they burn about half amount of fuel as a conventional plant to generate same amount of electricity. The capital cost for building a combined cycle unit is two thirds the capital cost of a comparable coal plant. Combined cycle units are commercially available from suppliers anywhere in the world. They are easily manufactured, shipped and transported. The turbines used in combined cycle plants are fuelled with natural gas, which is more versatile than a coal or oil and can be used in 90% of energy publications. To meet the energy demand now a day’s plants are not only using natural gas but also using other alternatives like bio gas derived from agriculture. Combined cycle plants use less fuel per kWh and produce fewer emissions than conventional thermal power plants, thereby reducing the environmental damage caused by electricity production. Comparable with coal fired power plant burning of natural gas in CCPT is much cleaner. The potential for combined cycle plant is with industries that requires electricity and heat or stem. For example providing electricity and steam to a Sugar refining mill. The gas turbine can only use Natural gas or high grade oils like diesel fuel. Because of this the combined cycle can be operated only in locations where these fuels are available and cost effective. Combined cycle power plants meet the growing energy demand, and hence special attention must be paid to the optimization of the whole system. Developments for gasification of coal and use in the gas turbine are in advanced stages. Once this is proven, Coal as the main fuel can also combined cycle power plants meet the growing energy demand, be used in the combined cycle power plant. The advances in cogeneration-the process of simultaneously producing useful heat and electricity from the same fuel source-which increases the efficiency of fuel burning from 30% to 90%, thereby reducing damage to the environment while increasing economic output through more efficient use of resources. I completed my post graduation in power electronics and graduated in Electrical and Electronics Engineering stream. Looking for an opportunity, internship in an core sector. My areas of interest on Renewable, power plants, especially Traction drives. Thanks for Explaining in etail about CCPP. Nice information sir, but is it possible to increase the efficiency of combined cycle power plant beyond 55 percent. You’ve stated the electrical efficiency of the plant. how much is the total efficiency of a natural gas combined cycle system? You state that supplementary firing (also know as duct firing) increases the efficiency. I do not believe that is true. I believe that duct firing actually lowers the efficiency. The reason duct firing is used is to increase the power output during times of high demand for electricity. Thus duct firing increases capacity but lowers efficiency. Agree. Lowers the thermodynamic efficiency. 2-	The chiller is calculated to reduce the turbine inlet air to 15 ° C ambient temperature conditions due to climate. 4-	Provide comprehensive project bid separately (E),(p),(C) or EPC contractor and delivery time of project. 5-	Heat exchange coil in the turbine air inlet is placed in a position that does not cause extreme pressure drop and fin coil with its strong and light material that will not damage the turbine air pressure. Thanks to all those who replied. Follow me on linkedin as vinod ramireddy. Coming to efficiency’s there is always theoretical approaches only,whereas practical one it always varies from our global view. Great article. Please can you recommend a good software for analyzing combined cycle systems? My email is valerieunu@gmail.com. I would like to open up further conversations with individuals and organizations looking for opportunities to deploy CCPT technology and equipments. Considering Vinod Ramireddy is/was an an undergrad student with EE major, this is an extremely well written article for Mechanical and Chemical engineers interested in this area. Great job Vinod . Write to me (narain@mtu.edu) if you want to contribute to the field and educate others (fellow graduate students and older Professors like me).